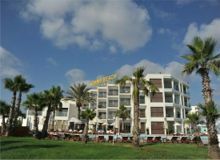 At Adams Beach Hotel in Ayia Napa, you can be sure that your every need and request will be attended to immediately by the friendly, helpful staff. You will have the pleasure of experiencing daily the services of a superb five-star resort. In our hotel there is no compromise. Makronisos Village Club is located in Ayia Napa, it has 122 rooms and was renovated in 2014. It is 500 m from a sandy beach. To make your stay more comfortable there is a lobby, some shops, a lounge, a reception and a mini market. The staff in this 2 story hotel speak English, there is even a playground for children.